The National Retail Federation issued its forecast of holiday retail sales. It expects a +3.6% increase compared to 2015. But what's the real increase? After deducting for inflation, that's about +1.5%. If real GDP comes in at +2% in the October 28, 2016 advance report for Q3, holiday retail sales growth will be in line with the growth rate of +1.4% for the year. In some ways, this can be a good year compared to recent history. 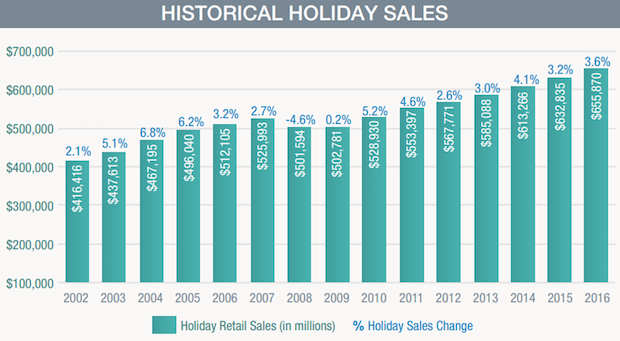 Holiday retail sales have averaged +2.46% since 2007, with a net after inflation of only +0.64%. On a per person basis, that's actually a decline in that period.